When No. 4 Alabama knocked off defending CFP champion Clemson and No. 3 Georgia slipped past Oklahoma on New Year’s Day, a ticket-sellers dream was born. Not once in the short history of the College Football Playoff has the national championship matchup been so geographically appealing. Within hours of the matchup being set, prices were heading up, up, up. According to TicketIQ.com data, the game will be the most expensive in CFP history, blowing away the previous high-ticket price of $2,992 in 2011. 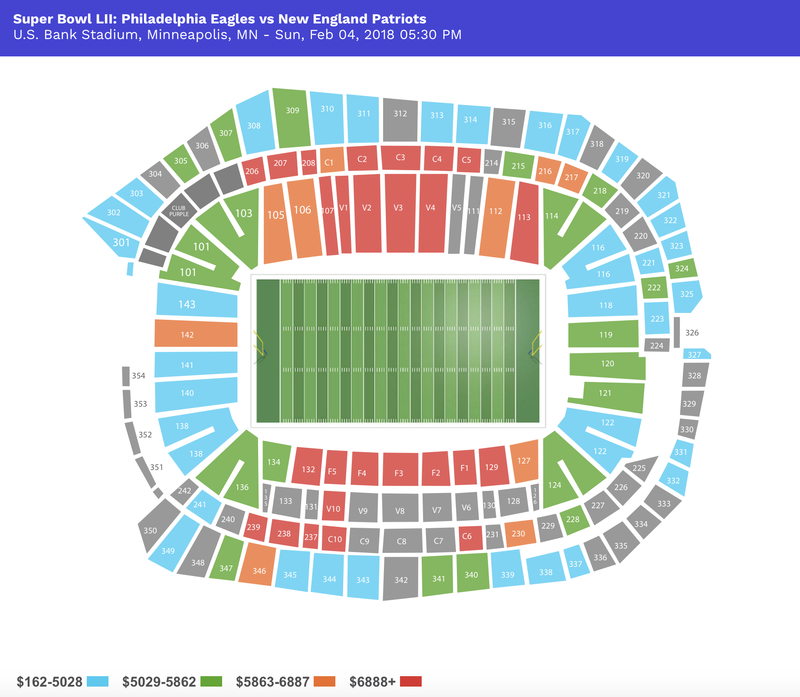 The average asking price for a ticket to the Jan. 8 game had risen from $3,887 prior to the start of the national semifinals to $4,254 following the conclusion of the Sugar Bowl. The Championship game, which will be played in Atlanta, presents a unique opportunity for fans of both games to drive to the event. Mercedes-Benz Stadium is an easy 72-mile drive from Georgia’s home field and only 200 from Alabama’s Tuscaloosa home. 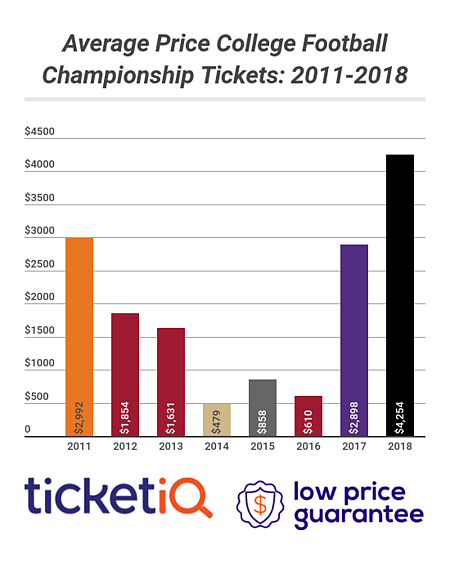 Over the last three weeks, prices for tickets to the national championship on TicketIQ.com have risen nearly $2,000, from an average asking price of $2,481 to $4,254. The cheapest ticket available for the game is now $2,175, compared to $1,503 on Dec. 11, 2017. The game will be only the fourth in the short history of the CFP, and marks the first time two teams from the same conference will play for a national title. The All-SEC final is the third consecutive time Alabama has played in the final. The next most geographically appealing game was last year’s Alabama-Clemson matchup, which was played at Raymond James Stadium in Tampa. Besides the cost to get into the game, the total cost for a CFP weekend in Atlanta may be among the least expensive in history. Both Georgia and Alabama have many alumni in the greater Atlanta area, so no plane ticket or hotel reservations are needed. But for those who do need a place to stay, the cost of hotels has dropped since Dec. 13, according to Priceline.com. The cost of a minimum 3-star hotel was $67/night for a two- or three-night stay, but has dropped to $45. This year’s College Football Playoff Championship may be the first one in three years and the fourth one since the series began in 2011 to not include Alabama, that doesn’t mean it will be a cheap ticket. Au contraire. As of Dec. 11, the average TicketIQ.com asking price for a ticket to the national championship at the Mercedes-Benz Stadium in Atlanta was nearly $2,400 – $500 more than a seat at January’s Alabama-Clemson thriller at Raymond James Stadium in Tampa. In fact, if things play out just so, this national championship could be the most expensive seat in College Football Playoff history. Only the 2011 Auburn-Oregon ($2,992) and 2017 edition ($2,898) have a higher asking price on the secondary market. With three of the four CFP semifinal teams within easy driving distance of Atlanta – Alabama, Clemson and Georgia – it’s easy to see why ticket prices are where they are. And if the final features Georgia against either Clemson or Alabama, it’s likely that tickets will shoot up even higher. Why? Georgia hasn’t ever played (though its been voted a national champion) in a national final for football. And, well, the Bulldogs would have a chance to win it all before the home crowd. If you’ve got $3,000-$4,000 to spend, so be it. But if not, check out TicketIQ’s Low-Price Guarantee listings. You’ll find tickets available for the national championship along the sideline in the upper half of the lower bowl for $2,470 (sections C108-C112 C126-C130).